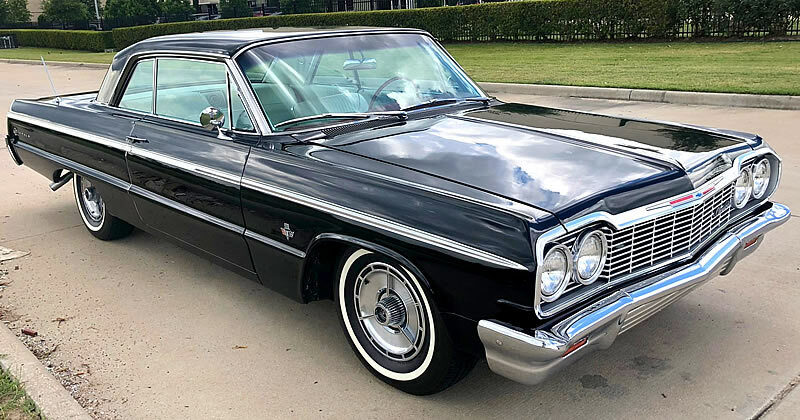 Well you'd certainly get noticed in this beautiful 1964 Chevrolet Impala SS Coupe in Tuxedo Black (code 900). This is an original SS car with the higher powered factory 409 V8 that output 425 horsepower. No longer simply a package, the Super Sport was a series in its own right and only available in the 2-door styles, the Impala SS was Chevrolet's high end model and distinguished with SS identification trim inside and out. Except for the Corvette, it was the most expensive Chevy available in '64. Only available in 2-door styles, the Impala SS was Chevrolet's high end model and distinguished with SS identification trim inside and out. Unique to the SS was the use of an upper body side panel with silver anodized insert with a machined swirl pattern. The rear cove also used these silver anodized inserts to highlight the outline. Special wheel covers were also provided as standard. 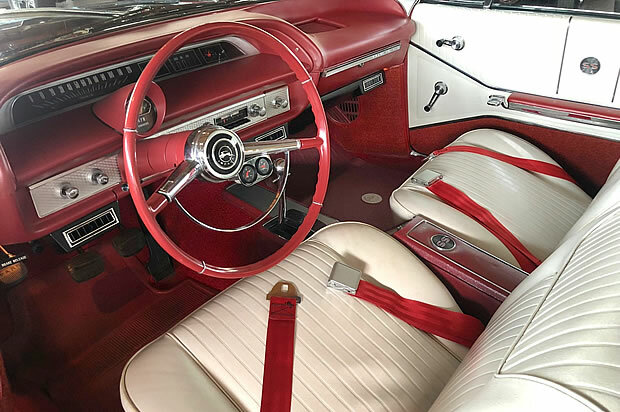 Inside is the original, full leather-grained vinyl upholstery in black (trim code 814) with bucket seats in the front separated with a bright-trimmed center console. There were also swirl pattern, machined instrument panel inserts unique to the SS. Power comes from the original 409 cubic inch Turbo-Jet V8 engine producing 425 horsepower. This is paired with a 4-speed manual transmission with the combination coming in at an extra $722. The 409 upgrade would have cost around $484 but this came with a 3-speed manual. An extra $238 for have been paid for the 4-speed. This car was also fitted with an AM radio which was an option costing $58.65. Chevrolet built 185,325 Impala Super Sport models for the 1964 model year. This figure contains a mix of the 2-door hardtop and convertible. A realistic estimate is about 90% of those cars were the hardtop which had a base price of $2,839 and came with a 140 horsepower, 230 cubic inch six cylinder engine. Interesting. We weren’t aware of this. 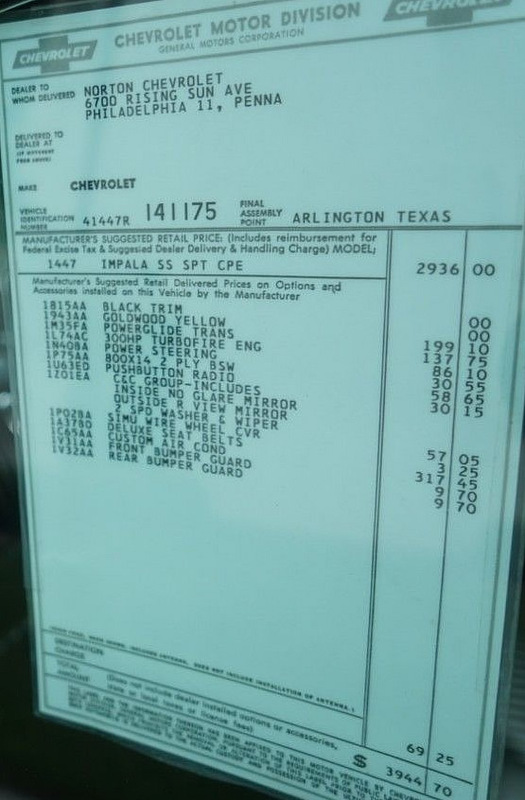 The copy of the original window sticker does have it listed. It would be interesting to know your reasoning behind this. whats the price tag and where can it be seen?? There’s a link to the auction on eBay at the base of the article.